We want to give our readers, clients, and friends a primer on what ideology is and where it comes from. This is a very long post, covering a large number of issues that we believe are crucial to understanding political psychology. Posts this long will not be a regular occurrence. Before we begin, we would like to credit Dr. John Duckitt as well as Dr. Chris Sibley (both currently teaching at the University of Auckland in New Zealand) for their pioneering research and theoretical work in developing the basics of this model. Thank you both. Conventional wisdom treats ideology as a set of beliefs and the labels that describe those beliefs. When public opinion researchers measure ideology, they usually define it along a simple left-to-right spectrum: from very liberal to very conservative, sometimes with an option for moderates in the middle. Liberals are generally thought to be socially inclusive, egalitarian, supportive of activist government, and favorable toward peace and cooperation abroad. Conservatives are understood to be traditionalists, free market and business-friendly, hostile toward centralized government, and either hawkish or sharply isolationist. Moderates are sometimes represented as a nebulous cluster with a mix of these two sets of views. Other times, they are thought to demand realist decision making at home and abroad, compromise between all sides, and accountable, thrifty, pragmatic government. There’s just one problem: this “left-right” model of ideology has been discredited for decades. Let’s briefly consider just a few of the major problems. Academics in both political science and political psychology realized a long time ago that placing people along a single left-right continuum does not accurately describe or predict their political attitudes and behaviors. The left-right model arbitrarily lumps together people who actually disagree with each other much of the time. For instance, conservatives in good standing can disagree with each other over immigration, gay marriage, and foreign policy, just as good liberals can disagree with each other over trade, health care, and environmental policy. The left-right model defines ideologies in ways that are demonstrably wrong. For instance, any definition of conservative that treats them as deficit-hawks ignores decades of evidence that deficits nearly always get worse during periods of conservative rule. Or any definition of liberal that insists all liberals are doves clearly hasn’t noticed the large number of liberals supporting military intervention. The model fails to capture or explain the millions of people who hold ideological beliefs that fit nowhere on the left-right spectrum: from libertarians to socialists, and from anarchists to monarchists. When used in polls, the left-right model generally relies upon self-identification. But we’ve long know that people adopt ideological labels which may not have any connection to their actual attitudes and beliefs. Ideological labels are notoriously indeterminate, containing many possible meanings and interpretations. The left-right model tells us nothing — absolutely nothing — about where ideologies come from, how they form, or whether and how they can change. Throughout the political psychology literature and in the real world, we see cases where two or more people make the same political demands but offer entirely different reasons for them. Jack and Harold may both oppose equal pay for women: Jack because he believes women belong at home taking care of the family and Harold because he’s uncomfortable competing in the workplace with women as equals. Political psychologists have found that these types of motivational factors are what really drives people’s beliefs. They are also central to the process of changing people’s minds. The focus on WHAT people believe is fundamentally misplaced. It’s like believing that the shark fin gliding across the water’s surface IS the shark, when it’s really just the part of the shark we can see. Liberalism, conservatism, libertarianism, and so forth are just dorsal fins, surface manifestations of ideology, not the thing itself. If you want to know what ideology really is, you have to look beneath the surface. Political beliefs and ideologies come from schemas. Schemas are highly stable, highly motivating networks of associations residing inside our heads that allow us to organize knowledge and interpret new information. They not only shape how we interpret reality, but what we expect and demand from it. Without schemas, our brains would be like a computer without an operating system, leaving us no way to comprehend our own thoughts and senses. Schemas begin to form at birth, partly through innate biological processes like Piaget’s stages of cognitive development. Parenting, social norms, and cultural expectations also play a key role — particularly in determining which schemas will prevail into adulthood. Schemas start off quite simple, but dramatically increase in complexity if supported. Once established and validated, they almost never change. In fact, the psyche will mount a nearly superhuman campaign of resistance to avoid changing a schema, especially one that has deep roots in childhood. More than just a worldview or a belief system, schemas have the full force of the psyche to back them up because they are the fundamental interpretive structures that bring coherence to the psyche and to our perceptions of reality in the first place. Psychologists have found that two schematic dimensions pertaining to the nature of the social world are the twin pillars of ideological thought. They are know as right wing authoritarianism and social dominance orientation. More than just attitudes, these two schemas represent entire clusters of assumptions, beliefs, personality traits, and behaviors. And also unlike most attitudes, which have a ephemeral quality, these contrasting sets of assumptions about the world appear stable, persistent, salient, and highly motivating. At the other end of this same dimension are those who hold few or no dangerous world beliefs. These individualistic, even self-absorbed types, see the world as safe, stable, and secure. People who see the world this way are strongly motivated to pursue personal freedom and autonomy, prefer new truths over inherited traditions, and speak out against repressive authorities through acts of rebellion and free expression. Anti-authoritarians or low RWAs, as they are known in the literature, are generally open to new experiences, display a greater need for accuracy, cognitive complexity, and individuation, are inclusive of deviant groups and out-groups, and tend to prefer non-violent solutions. In effect, low RWA is a schematic bias toward autonomous individuation and expression, so for clarity we have dubbed these individuals expressives. The second schematic dimension that contributes to ideology — social dominance orientation — revolves around beliefs in a competitive world. Those who hold such beliefs see the world as a competitive jungle characterized by a ruthless, Darwinian struggle for survival. These dominating, Machiavellian personalities are motivated to seek superiority over others, value winning above all else, and believe that might equals right. In political psychology, these persons are said to have high social dominance orientation or high SDO. High SDOs show a strong preference for social, economic, and political inequality, as well as hierarchy and status. They value power, achievement, efficiency, toughness, maleness, hedonism, and aspire to a dominate others. People high in SDO tend to lack empathy, show an interest in manipulating others, express enormous cynicism, and believe the ends justify the means. In effect, high SDO is a schematic bias toward competitive dominance, so for clarity we have dubbed these individuals dominators. At the other extreme are those who hold few or no competitive world beliefs. These cooperative, confident individuals perceive a world of plenty that perhaps has been corrupted by unfair privilege. Motivated to help others, they demand greater social, economic, and political equality, and generally prefer altruism and humanitarianism over exploitation and coercion. Often referred to in the literature as egalitarians or low SDOs, these highly agreeable, respectful, compassionate, empathetic, and other-focused individuals are the quintessential problem-solvers and team players. In effect, low SDO is a schematic bias toward equality and constructive cooperation, so for clarity we have dubbed these individuals cooperators. Repressives and expressives. Dominators and cooperators. These four elemental schematic temperaments are like the north, south, east, and west of ideological thought and behavior. To be clear, everyone possesses schemas for danger, safety, competition, and cooperation. And there are plenty of ways to make people temporarily feel and act more cooperative, competitive, fearful, or expressive. The question is which of these shapes our assumptions about the world when we aren’t reacting to any particular object, person, circumstance, or topic. Ideology is ultimately about which of them best characterizes our personality and temperament. 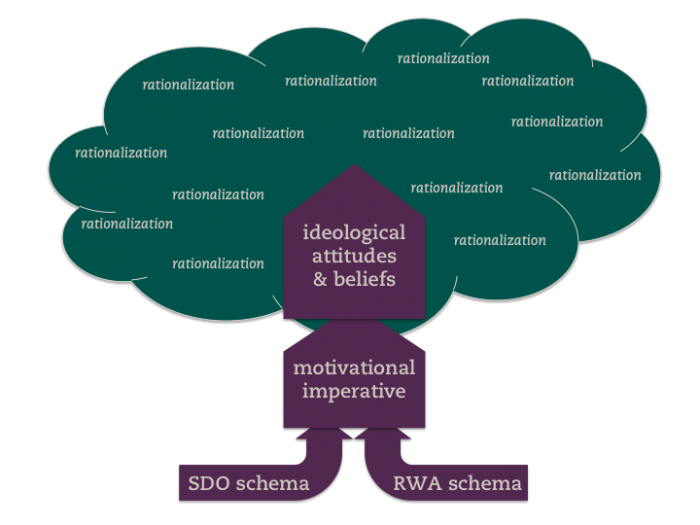 In the political psychology literature, this is known as the dual-process model because there are effectively two processes at work (RWA and SDO) contributing to ideological and political thought. Readers encountering this model for the first time may be tempted to think that dominators are always economic conservatives, repressives are always social conservatives, expressives are always social liberals, and cooperators are always economic liberals. This way of thinking is WRONG. That’s because each schematic temperament gives rise to opinions on a full range of issues. Dominators are no less opinionated on social issues than repressives, and repressives are no less opinionated on economic issues than dominators. Sometimes they will agree with each other; sometimes they won’t. It’s their schematic biases and their motivations that distinguish them, not their pro-forma positions and attitudes. Remember our example earlier of Jack and Harold who both opposed equal pay for women. Telling you which of them is the social conservative and which is the economic conservative is a fool’s errand — after all, they both take the same view. And the fact is that equal pay for women is an issue with social, economic, political, and even potentially foreign policy implications. But I bet if you go back and look at Jack and Harold’s contrasting motivations, it might clue you in to which one is a repressive and which one is a dominator. 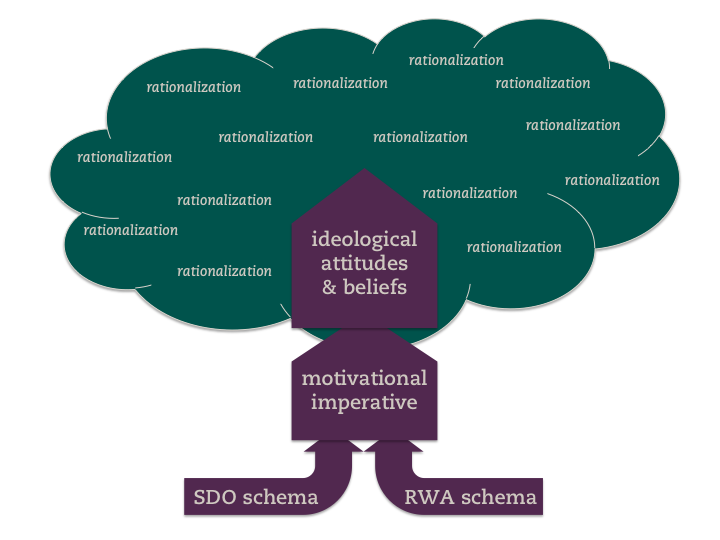 What’s important to remember is that RWA and SDO are not ideologies themselves, but the schematic foundations upon which ideology is constructed. Indeed, the four elemental schematic temperaments are a set of perceptual biases and motivations that manifest in many areas of our lives besides politics. They are part of our personalities, and they only become ideologies after people take an interest in public affairs. We already reviewed in an earlier post how politics is what happens when people displace and project their private motives onto public objects. In other words, the more we think about public affairs — the more we try to bring coherence to what we see, believe, and demand in politics — the more our schematic biases influence what we see, believe, and demand. This isn’t something that can be avoided, any more than we can avoid seeing with our own eyes or hearing with our own ears. That’s because our dominator, cooperator, expressive, and repressive biases are wired into our personalities. As we have argued before, most of public life occurs in our heads. So it should come as no surprise that our political perceptions, beliefs, and demands are highly susceptible to the biases of the psyche. This is why human beings don’t all think, believe, and act the same way — least of all in politics. Our biases mean we literally see different worlds. Under the right circumstances, imagination, empathy, and intellect can help us see past our own schematic filters, but only if we acknowledge that we have biases in the first place. And that takes a lot of conscious effort. Even with the effort, no one can ever fully escape their own biases. But without that effort, imagination, empathy, and intellect will just reinforce and perpetuate our existing beliefs, ideas, and demands. What this means is that there is no such thing as purely non-ideological thought. The only question is whether you acknowledge your biases to yourself, to others, and how much effort you make to see past them. People who claim not to have an ideology either haven’t thought about politics much, haven’t really come to terms with their own biases and motivations, or are concealing their motivations for strategic reasons. Organized political thought is its nature ideological because organized thought is by its very nature schematic. A person who has no ideas and expectations about the way the world works is going to have a hard time coming up with demands that are coherent, relevant, or persistent for very long. Look beneath the surface of any political belief or set of beliefs and there’s always a schema or two motivating them. This is especially true of those in the ideological center, who think of themselves as moderates. Here’s what we know about people in the middle. Both right wing authoritarianism and social dominance orientation are linear dimensions. Here’s what this means. When you measure an RWA or SDO trait, people with average scores fall about half way in between people at the high end and at the low end. So for instance, if low RWAs demand greater complexity and high RWAs demand greater simplicity, then midpoint RWAs demand a modest amount of complexity…but not too much. If high SDOs see the world as a competitive jungle and low SDOs see a world of plenty, midpoint SDO’s will see a world that has some elements of both. We’ll often refer to RWA and SDO moderates as midpointers, because they are literally at the midpoint of two end poles. There is a clear distinction between high and low RWAs and SDOs. Highs and lows are categorically different from each other…and that’s true for both domains. Those in the middle may look like they belong in a third category, but in fact their traits are the result of a cross between highs and lows. Midpoint psychology is akin to what happens when two primary colors blend or when two streams converge. The outcome may look distinct, but it isn’t the result of a third, independent process. While midpoint SDOs and RWAs have not been the focus of political psychology research, here at First Person Politics we believe there is enough evidence in the literature to justify preliminary portraits of their motivations. Positioned half way between repressives and expressives, midpoint RWAs — or as we call them respectives — see a changing and challenging world. Respectives see a world of constantly shifting — and sometimes incompatible — expectations, all of which they feel obligated to respect. The respective’s personality structure is a reaction to a world characterized by inconsistent demands. Their motivational goal is to stabilize and reconcile conflicting expectations, rather than generate new ones or enforce those that already exist. Respectives are motivated to seek continuity to compensate for change, familiarity to compensate for uncertainty, and reassurance to overcome difficulty. When it comes to authority, respectives typically prefer accommodation instead of submission or outright challenge. And when it comes to deciding between repression and non-conformity, they’ll generally tolerate both so long as they remain distant and non-threatening. Respectives are inclined to fly with their own flock, and strongly disinclined to get too far out in front OR to get left behind. Positioned half way between dominators and cooperators, midpoint SDOs — or as we call them meritors — believe in a just, mertiocratic world in which people get what they deserve. The meritor’s personality structure is reaction to a world that inconsistently responds to their needs. As a result, their motivational goal is to prioritize taking care of their own needs and the needs of anyone dependent on them. Meritors develop a belief in a just world to compensate for the arbitrariness of life. They believe that people who work hard and play by the rules will be rewarded, and that there exists equal opportunity and a level playing field for all. They demand this as well. They deeply resent extra assistance of any kind for the undeserving — no matter their station in life. Meritors may find extreme inequalities distasteful, but as long as they believe the means were fair and the opportunities equal, the ends are beyond reproach. Schematic bias fundamentally shapes ideology, but not necessarily partisanship. That’s because partisanship is much more closely tied to social influences and tribal effects. So long as people aren’t overwhelmed by these (e.g. “my friends/relatives/neighbors are all Democrats, so I’m a Democrat too”), they will tend to support whichever party or coalition they believe is best able to validate and perpetuate their schematic and motivational biases. Why don’t more cooperators join the Green Party or more dominators join the Libertarian Party in the United States? The Greens and the Libertarians may do a better job of validating certain biases, but as a third parties in a two party-dominated system they do a terrible job at perpetuating them. Hopefully it isn’t too hard to figure out where each of the six types would probably land in American politics today. The American right today tends to cater to the beliefs and demands of dominators and repressives. While the American left is today organized around the tastes and interests of expressives and meritors. Early in the 1990s and 2000s, the comparatively small number of cooperators in the electorate generally became Democrats because of the party’s historic roots as an egalitarian, cooperator-led party. Both parties fought hard to win over a block of largely — though not exclusively — respective swing voters. It wasn’t always this way, nor will it remain this way forever. Consider that the New Deal era Democratic Party was actually a coalition of cooperators and repressives. The repressives of that era were commonly known as the Dixiecrats. In today’s world, it’s admittedly something of a mind-bender to think of authoritarian-leaning repressives as belonging to a left wing coalition. But liberals they were — at least on economic issues. However when it came to racial politics, repressive Dixiecrats blocked significant action on these issues by the Democratic Party until the 1960s…at which point American politics began to realign into its present day coalitions. In their book Authoritarianism & Polarization in American Politics, Hetherington and Weiler showed how beginning in the 1960s the two major parties gradually sorted themselves into authoritarian (repressive) and non-authoritarian (expressive) camps. A brief note is in order to clear up some common misconceptions about authoritarianism. In everyday conversation when we think about authoritarianism, we imagine either ideologies and systems of government like fascism, communism, or imperialist monarchies; OR we think of social relations characterized by hierarchy, exclusion, and violence. Here’s the problem with this way of thinking about authoritarianism: it lumps the dominators (high SDOs) and the repressives (high RWAs) together into the same despotic pile. It is true that authoritarian systems and ideologies usually need both dominators and repressives to gain any kind of traction in the real world. But when psychologists talk about authoritarian individuals and personalities, they’re only talking about repressives. That’s because the psyches of repressives look very, very different from the psyche of dominators. Go re-read the descriptions of them if you need reminding. They’re almost nothing alike. Have you ever noticed how leaders of authoritarian systems, institutions, and movements never seem play by their own rules? Have you noticed how they seem unusually prone to naughtiness and misbehavior they would condemn in their followers and enemies? It’s because the people at the top of authoritarian systems are usually dominators, not repressives. Repressives elevate dominator personalities to positions of power because that’s the style of leadership their psyches are wired to crave. And dominators like to surround themselves with repressive underlings because that’s where the deferential, obedient, worshipful followers they crave can be found. Without submissive repressives to follow them, dominators often feel weak and impotent. Without dominators to lead them, repressives feel anxious and fearful. The two fit together like a lock and key. It’s a mutually beneficial relationship, psychologically. An identical and parallel relationship exists between the highly demanding and emotive expressives and the highly receptive and responsive cooperators. Tension and conflict often arises when this leader-follower relationship is inverted, mismatched, or both. One other point about authoritarianism is worth mentioning. Scholars have been searching for left wing authoritarianism for decades and have yet to find any evidence of it. Bob Altemeyer famously called it the “Loch Ness Monster of political psychology.” In our opinion, that may be because they haven’t yet looked in the right place. We think left wing authoritarians may have two possible origins. One possibility is that left wing authoritarianism may come from the interaction of BOTH very low SDO and very high RWA inside the same person. The result would be a personality type that has deeply egalitarian and redistributionist impulses but is also hostile to outsiders and dissenters and holds deeply prejudicial beliefs. It’s not hard to see how leaders like Hugo Chavez, Fidel Castro, or even Pope Francis might fit this profile. Later on in this post, we’ll go into more detail about how SDO and RWA interact with each other. A second possibility is that some left wing authoritarians may actually be dominators masquerading cooperators, forced to adopt some of the trappings of the egalitarian left to succeed inside a communitarian political culture. Stalin and Mao could be potential instances of this phenomenon. If that is so, then this type of “left wing authoritarian” is something of a misnomer; it’s probably more accurate to describe them as “left wing dominators.” These would be dominators whose manipulative, exploitative personalities have found a way to co-opt a leftist movement. Regardless, left wing authoritarianism is not recognized in political psychology as an elemental schematic type. And with all the confusion surrounding authoritarianism, hopefully you can see why we try to avoid the term when possible. Political psychologists studying ideology have found that biology, personality, and parenting (socialization) all contribute to schematic bias and ultimately to ideology. But parenting styles seem to play a crucial role. There are basically two factors we look at when evaluating a parent-child relationship and its consequences. 1) Is the parent demanding or undemanding towards the child? 2) Is the parent responsive or unresponsive toward the child? A demanding parent expects much of the child, raising the child to respond to the parent’s wishes and desires. An undemanding parent expects very little, allowing the child to behave and develop relatively free from obligations. A responsive parent is highly attentive to the needs of the child, and is generally actively involved in the child’s development. An unresponsive parent is dismissive of, ignorant of, unable to, or unwilling to respond to the needs of the child. Obviously, no parent or combination of caregivers is the perfect distillation of any one of these extremes. Rather each parent strikes a balance between them — sometimes by choice, sometimes by necessity, sometimes due to an unconscious predisposition. When demanding-ness and responsiveness interact, they give rise to four basic parenting styles. A parent who is both demanding and responsive is an involved parent. A parent who is both demanding and unresponsive is a strict parent. A parent who is both undemanding and responsive is an indulgent parent. A parent who is both undemanding and unresponsive is a neglectful parent. All things being equal, each parenting style produces children with a distinct schematic orientation toward the world. Keep in mind that a child raised in a two-parent home is exposed to two parenting styles, one from each parent, and those parenting styles are rarely the same. Neglectful parenting produces children with dominator (high SDO) tendencies, and a schematic bias toward competition. In the absence of expectations or responsive adults, these children learn to assert themselves to get their needs met. With few structures and rules to guide them, they come to see the world as a kind of competitive jungle of predators and prey, in which only the strong and assertive survive. Children of neglectful parents tend to be emotionally withdrawn, value their independence and status, and will fiercely resist attempts by others to establish or enforce boundaries. Dominators are the kind of children who make and play by their own rules, and expect others to follow or get out of the way. Strict parenting produces children with repressive (high RWA) tendencies, and a schematic bias toward danger. Surrounded by adults who demand everything but give nothing in return, these children become deeply anxious, dependent on authority figures, and learn to associate obedience and conformity with love. They come to see the world and nearly all social situations as potentially threatening, and seek safety within communities, institutions, and belief systems that have clear rules and rigid social norms. Repressives are the kind of children who never hesitate to punish those who don’t color between the lines. Indulgent parenting produces children with expressive (low RWA) tendencies, and a schematic bias toward safety. Raised by adults who give, give, and give, but rarely ask anything in return, these children tend to be self-involved, undisciplined, and demanding of those around them. Strongly inclined to challenge authority and seek their own private truth, expressive children grow up to become sharply confrontational moralists who have more to contribute to society’s culture and spiritual life than to public affairs. Open to new people and visionary ideas but equally open to conflict, expressives are the type of children who will never hesitate to shake things up. Involved parenting produces children with cooperator (low SDO) tendencies, and a schematic bias toward equality. When the adults are as responsive as they are demanding, they raise children who are highly competent, confident, and cooperative — if at times a bit conformist and co-dependent. These children learn to see a world in which every problem has a solution rooted in teamwork, and they share a strongly egalitarian spirit. The constant involvement of protective and encouraging parents gives them a deep trust authority figures, somewhat stunting their ability to cultivate ideas of their own, prioritize, and strategize. Nevertheless, once cooperators children reach agreement and decide to act, virtually nothing can stand in their way. 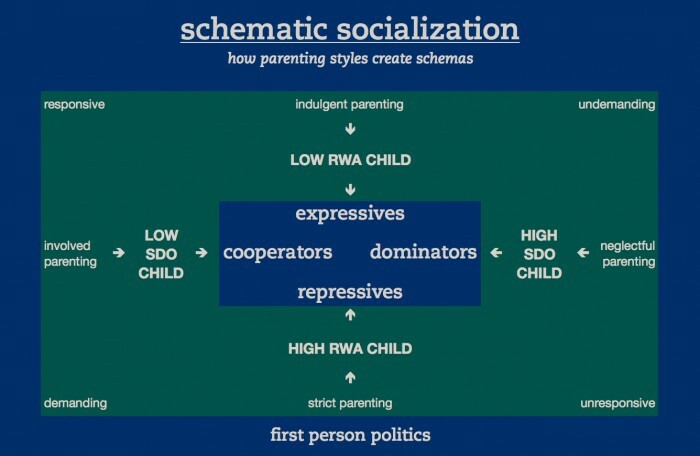 This matrix linking parenting styles to schematic biases to ideology works almost like an algebra equation. The more variables you can fill in about a person, the more you can infer. Take a look at the chart below. For simplicity’s sake, we’ve left out respectives (average RWAs) and meritors (average SDOs). If you know that a person was raised in a two parent household, it’s a pretty safe assumption that they were subjected to contrasting parenting styles. It might also be that one parent was more or less demanding and one was more or less responsive. So for instance, you can infer that a person with strong repressive tendencies had either two strict parents or one unresponsive parent and one demanding one. Likewise, if you have a firm grasp of the parent(s)-child relationship, you can say with pretty high degree of likelihood which of the four schematic types will ground that child’s worldview. So where do respectives and meritors come from? The respective (midpoint RWA) schema seems to be the result of parenting typified by inconsistent or fluctuating demands. The child is either torn between two sets of incompatible demands or faced with parental demands that are made and enforced inconsistently. To cope, the child adopts a posture of detachment, acquiescence, and accommodation, leading to moderation, a preference for continuity, and a conciliatory distancing from the demands made by others later in life. The meritor (midpoint SDO) schema seems to be the result of parenting typified by inconsistent or fluctuating levels of responsiveness. We know from system justification theory that when people are dependent on others but have a low sense of control, they adopt just world beliefs — which is another way of saying meritocratic beliefs — about the world to compensate for their feelings of vulnerability. The accompanying tendency to excuse, justify, and rationalize life’s arbitrariness and injustices is probably a compensatory reaction to the sense of unfairness borne out of inconsistent responsiveness. Much more research is needed into the origins and characteristics of RWA and SDO moderates; however, we are confident that that profiles that emerge will look more or less like what we have described above. Parenting styles seem to affect the schematic biases of generations as powerfully as they do for individuals. The founders of generational theory, Williams Strauss and Neil Howe, identified the key role that parenting styles play in generational formation. Parenting styles and widespread attitudes toward children conspire to forge the archetypal character of each new generation…and then history then fills in the details. Every 20 years or so, parenting norms shift in a way that promotes indulgent, neglectful, involved, or strict parenting. And they do so in a repetitive cycle. This is not to say that every generation has one and only one schematic bias. It doesn’t take much knowledge of history to see that there are dominators, repressives, expressives, cooperators, as well as meritors and respecitves born in EVERY generation. Rather, each generation in the aggregate seems to have more of one schematic bias. Whether that’s because there are more people of one type born in a generation or because the schematic center of gravity shifts in a particular direction is not known. What is clear is that generational behavior seems to conform with uncanny precision to the basic outlines of the four elemental schematic biases we identified earlier. We’ll do a lengthy exposition of generational theory at some point in the future, but for now we will leave you with a brief generational key. Prophet/idealist generations are expressives, raised by indulgent parents. Baby Boomers born from 1942 – 1960 are the expressive generation of this era. Nomad/reactive generations are dominators, raised by neglectful parents. Gen Xers born from 1961 – 1981 are the dominator generation of this era. Hero/civic generations are cooperators, raised by involved parents. Millennials born from 1982 – 2004 are the cooperator generation of this era. Artist/adaptive generations are repressives, raised by strict parents. Silents born from 1925 – 1942 are the repressive generation of this era. They will be replaced by a new artist/adaptive generation born from 2005 to sometime in the mid 2020s. Each generation’s entry into and exit from the electorate shifts the country’s ideological center of gravity. Our own research has shown that generational effects also manifest in political institutions and legislative chambers, like the Senate and House of Representatives. Probably the clearest and most widely recognized example of generational shift would be the case of the Baby Boomers, a generation with abundantly expressive tendencies. Born in the aftermath of the Great Depression and World War II, Baby Boomers were raised in an era of stability and consensus by parents eager to shower their children with the many rewards of their hard won prosperity. Thus a generation of narcissistic expressives was born. Baby Boomers led the cultural and sexual revolutions of the late 1960s and 1970s as well as the self-absorbed anti-tax and evangelical crusades of the 1970s and 1980s. The oldest sliver of Baby Boomers cast their first ballots in 1964; the very youngest did so in 1980. Think of it this way. Before the Boomers entered the electorate, America was the country of Kennedy and Johnson. By the time all of them bad become eligible to vote, America was the country of Reagan and Bush. It is no coincidence that the Culture Wars escalated as more and more Boomers entered the electorate, or that politicians become more and more outspoken and confrontational the more they catered to Boomer tastes. Baby Boomers gained a numeric majority in the U.S. House of Representatives in 1995, with Newt Gingrich leading the way. They gained a numeric majority in the Senate in 2001. As Boomers have risen to positions of leadership, Congress has become more and more polarized and gridlocked. You can see a similar process at work as the Boomers have come to dominate the Supreme Court. The two presidents to hail from this generation — Bill Clinton and George W. Bush — are both quintessentially expressive politicians, reflecting the cultural tastes and political preferences of each side of the Boomer argument. It’s possible we may get one more Boomer president. And Boomers have yet to ascend to all the top leadership posts in Congress. Politically, America may not reach “Peak Boomer” until the late 2010s or early in the 2020s. When we do, that will truly be a day of reckoning with profound ramifications for the future of the country, and probably the whole world. In the first decade of the 21st Century, repressives (Silents), expressives (Baby Boomers), and dominators (Gen Xers) were the prevailing forces in American politics. The last cooperator generation, the Greatest Generation, had largely died out and a new one had yet to enter the electorate in significant numbers. As a result, inequality skyrocketed and consensus all but vanished, as did any sense of civic cooperation and common purpose. But that began to change in 2008, when the Millennial Generation started to have an impact on national politics by electing Barack Obama. This rising cooperator generation is slowly beginning to pull American politics back to a more egalitarian, civic-minded direction. Whether our governmental institution are still capable of responding to their demands remains an open question. We will have much more to say about the nexus of generational factors and schematic-motivational bias in future posts. Our aim here was merely to point out that schematic bias affects generations as much as it affects individuals, and to note that this has profound consequences for American politics. The picture of how ideology forms starts to get even more interesting when you look at how the two schematic domains — right wing authoritarianism and social dominance orientation — interact with each other inside the psyche of a single person. Remember, every person possesses both RWA and SDO domains. Everyone has a certain amount of RWA and a certain amount of SDO. Here’s the problem the psyche faces. The demands of a cooperator, meritor, or dominator schema may not be compatible with the demands of an expressive, respective, or repressive schema. But the psyche WANTS to find a way to reconcile them to reduce cognitive dissonance. The interaction of the two schematic domains gives rise to what we call motivational imperatives. 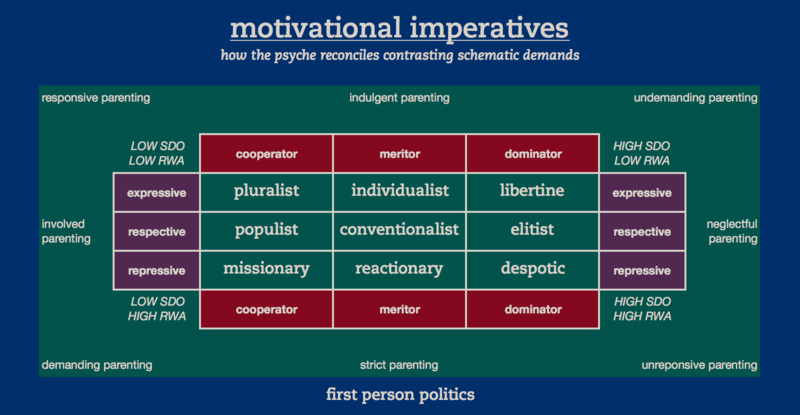 Motivational imperatives are the direct antecedents of ideological attitudes and beliefs. Let’s consider Andrea, who scores very low on SDO and about equally low on RWA. Andrea possess the schematic ingredients of both a cooperator and an expressive. But the fact is that you can’t always be a cooperator and an expressive at the same time. There are cases when the teamwork necessary for cooperation requires a certain about of conformity, a willingness to suspend full and free expression. If Andrea expresses herself freely and follows her natural inclination to challenge authority, she risks creating the conditions for conflict, disagreement, and mistrust that could easily get in the way of group cooperation. Andrea’s psyche demands both cooperation and expression. But how to reconcile the two? With pluralism. Pluralism is a commitment to diversity and diverse viewpoints that allows for the possibility of overlapping consensus. Pluralism acknowledges that we all have different ideas and different beliefs, but we can all work together on the things we agree on. Andrea may not know the word “pluralism,” and she may not even know why she thinks it’s a good idea. But she will gravitate toward ideas, groups, and situations that have a pluralistic character because it reduces the tension between two sets of contrasting demands built into the fabric of her psyche. All of this will happen before Andrea ever takes an interest in politics, and will shape the choices she makes throughout her life. If she takes an interest in politics, the pluralistic impulse will fundamentally shape what she sees, expects, and demands. Her point of entry into public life will be either a person or event that validates or provokes her pluralistic impulses. If she decides to get involved, she’ll seek out people and sources of information to confirm and perpetuate her pluralistic impulses. The more she thinks about it, the more Andrea will come to see a pluralistic world as the ideal. This process of rationalization will have as much to do with Andrea’s own impulses as with the people and ideas she surrounds herself with. In time, she’ll adopt a robustly pluralistic ideology like liberalism, progressivism, democratic socialism, or maybe even left wing anarchism and make its accompanying beliefs her own. The more involved she gets and the greater her knowledge and experience, the more committed she’ll be to her ideology. But it’s the struggle to reconcile her low RWA and low SDO that will have been motivating her all along. Everyone has a certain amount of RWA and a certain amount of SDO. The only questions are how much of each and how to reconcile the two? Here now is the matrix describing the core motivational imperatives that typically arise as people reconcile their RWA and SDO schemas. We’ll say a brief word about each one below. Pluralist motives minimize the tension between cooperator and expressive schemas. Pluralists reconcile the two by demanding a world where diverse points of view are balanced by constructive action whenever there is overlapping consensus. Populist motives minimize the tension between cooperator and respective schemas. Populists reconcile the two by standing up for the little guy, but only so long as the little guy isn’t part of a feared or mistrusted out-group. Missionary motives minimize the tension between cooperator and repressive schemas. Missionaries reconcile the two by backing traditionalist authorities and strict social norms aligned with their charitable and redistributionist goals. Individualist motives minimize the tension between meritor and expressive schemas. Individualists reconcile the two by insisting on equal opportunity for all so that each person can be the sole author of their own destiny. Conventionalist motives minimize the tension between meritor and respective schemas. Conventionalists reconcile the two by justifying established systems, authorities, and institutions, as a way of distancing themselves from people demanding change. Reactionary motives minimize the tension between meritor and repressive schemas. Reactionaries reconcile the two by backing sharply punitive measures directed at anyone who challenges established authorities and ways of doing things. Libertine motives minimize the tension between dominator and expressive schemas. Libertines reconcile the two by demanding extremely high performance of themselves and others and rejecting limitations of any kind. Elitist motives minimize the tension between dominator and respective schemas. Elitists reconcile the two by demanding that the highest ranking be empowered to set the rules that everyone else must follow. Despotic motives minimize the tension between dominator and repressive schemas. Despots reconcile the two by supporting ruthless and coercive actions directed at those who stand in their way. The chain linking a person’s psychology to their ideological beliefs is nearly complete. As we can now see, a person’s RWA and SDO schemas interact with each other, giving rise to nine core motivational imperatives. These motivations become ideologies when they are systematically displaced and projected onto objects in public life. They give rise to a set of attitudes, beliefs, and assumptions about the world which are then justified through the process of rationalization. Rationalization means exactly what it sounds like it means. Reason helps people make excuses for what our psyches want. The great philosophers and theorists of the Enlightenment thought reasons created attitudes, which then produce motivations. But modern psychologists figured out they got the causal chain exactly backwards. Motivations create attitudes, which then produce reasons. Psychologists have long understood that reason isn’t really in charge of the human mind. Reason works like a lawyer or a press secretary for the psyche. It’s there to help you make the case for what you want and believe. Only on rare occasions does it actually help you figure out what you want and believe, like a scientist or investigative reporter. If you want to see how reason works, all you need to do is start a political argument with somebody who disagrees with you. You can overcome your opponent’s objections and answer their best arguments…but it won’t matter because they’ll just come up with new arguments and pieces of evidence in place of the ones you’ve knocked down. As soon as they run out of justifications for their beliefs, they’ll either angrily dig in their heels or walk away from the conversation to avoid further conflict. That’s because people are more convinced by their own beliefs than they are by evidence, logic, and truth. Why? Because their beliefs — especially their schemas — are wired into who they are. Evidence and logic and truth are not. It’s understandably disconcerting — particularly to our modern day rationalist sensibilities — that this is the way human reasoning works. After all, if you’re reading this blog you were probably taught the Enlightenment model of reason: that the best argument will win, that evidence will decide, and that the truth will set you free. Indeed, if reasons and evidence are at the mercy of people’s motivations, what hope is there for finding the truth? What hope is there for changing people’s minds? What hope is there that we can have any kind of consensus reality if people just cherry-pick the facts and arguments to suit their preconceived ideas? Don’t throw up your hands in despair just yet. There is a way to change people’s minds and achieve consensus. You do it by focusing on their motivations, not their arguments. If you don’t know what to look for, you’ll never be able to tell which is which. Attitudes tell you what people believe. But reasons and arguments — or as psychologists call them rationalizations — don’t necessarily tell you anything about why they believe it…though they might give you some important clues. Rebutting and pre-empting arguments won’t change minds, because as soon as you overcome one objection, another one will rise to take its place. That’s why the focus on arguments in politics — and on messaging aimed at overcoming objections and winning debates — is fundamentally misplaced. If you want to change people’s minds, you have to align with their motivations. You have to target the trunk of the tree, not the branches and leaves. Not every candidate or cause can be aligned with every motivational imperative. But if a person or group can be persuaded, its through their core motivations. Align with a their motives…and their reasons, arguments, and evidence will take care of themselves. Almost like magic, every argument, justification, and fact they can come up with will suddenly support the point of view you want them to take. That’s because when you’re aligned with someone’s motivations, they literally start seeing the world your way. Under the right conditions, we CAN use reason to evaluate arguments, weigh the evidence, and learn the truth. If we couldn’t do this, then science — and all the great leaps in human knowledge and understanding of the last 500 years — would never have been possible. We have it within our power to temporarily make our brains use the Enlightenment model of reasoning. But to do so, it takes a lot of mental effort, rigor, and even a certain amount of accountability. People have to have received training in the methods for discovering, verifying, and telling the truth, and must actually use those methods as part of their normal day-to-day operating procedures. That’s because truth doesn’t just happen all by itself. To prevail in the face of competing priorities, the truth has to be prioritized, normalized, institutionalized, and enforced. We call this a culture of truth. Unfortunately, cultures of truth almost never exist in politics and government. That’s by design. When the founders of the United States established our government, they sincerely believed human beings were rational, informed, self-interested beings — and they gave us a republic built on those assumptions. To their credit, Jefferson, Franklin, Adams, and company were using the most cutting edge thinking of the late 18th Century. But nearly everything the founders believed about the way reason works was wrong…just as they were wrong about slavery, women, and host of other things. Nearly two and a half centuries later, it’s time to acknowledge reason’s subservient role in human behavior and adjust the way fight for political and social change. We’ll show you how it’s done. Reason isn’t in change. The psyche is. That’s why it’s a mistake to understand ideology as a set of reasoned beliefs and the labels that describe them. In reality, ideology is a set of motivational imperatives that have their roots in personality, socialization, and schematic bias. Psychologists have identified two schematic dimensions that are the building blocks of ideology: right wing authoritarianism and social dominance orientation. These two domains give rise to four elemental temperaments at the end poles of each dimension: dominators and cooperators for high and low SDO; represssives and expressives for high and low RWA. Two hybrid temperaments can be used to describe people who fall near the midpoints of these dimensions: meritors for average SDO and respectives for average RWA. Every person has both an SDO and an RWA temperament. A person’s motivations arise out of the struggle to reconcile their two contrasting schematic biases. We have identified nine motivational imperatives which are the direct antecedents of ideology and political belief. These motivational imperatives will fundamentally shape what people believe, structure how they perceive the world, and determine what they demand from it. When people make arguments and give reasons for their opinions, those arguments are generally after-the-fact rationalizations of what their motivations dictate. That’s because reason serves the psyche, not the other way around. If you want to change people’s minds, you do so not by overcoming their objections and winning arguments but by recognizing and aligning with their core motivations. Schematic biases have at least some of their origins in biology and innate personality, but are strongly influenced by parenting styles and socialization. Generations also seem to be shaped by schematic bias. As they enter and exit the electorate and positions of power, their biases alter the ideological character of the nation and the institutions they occupy. We believe that this psychologically informed model of ideology greatly enhances our understanding of politics and history. Furthermore, it gives us a way to actually change people’s minds — instead of wasting time responding to their endless supply of objections. Here at First Person Politics, we can equip you with the tools you need to use this model in your next poll. You can try out our demonstration of the survey here. We can also review your existing public opinion research to help you align your messages with the groups you need to persuade. As we lovingly remind our clients, this model of ideology only works if you use it. And nobody in the industry besides First Person Politics is using it. Contact us today to learn how. We can’t wait to hear from you! comment due to this good post. Thanks for the article.This has cleared my understanding on ideologies. Motivation is what makes us pursue our ideologies, our view points. Way of seeing the world differs from individuals but this can always be changed based on what motivates them. Awesome blog! Is your theme custom made or did you download it freom somewhere? A design ike yours with a few simple tweeks would really make my blog stand out. to ssay that I’ve really enjoyed browsing your blog posts. Remarkable! Its in fact awesome post, I have got much clear idea concerning from this post. I have read so many posts about the blogger lovers but this article is truly a good article, keep it up. all be capable of without difficulty be aware off it, Thanks a lot.